Waldkirch, September 2018 – The TDC-E Telematic Data Collector is yet another addition to SICK’s portfolio of gateway systems. This solution offers extended functionalities for capturing, processing, and transmitting process and sensor data. As a high-performance communication platform with an open end-to-end IoT architecture, the TDC-E now offers numerous analog and digital connectivity options for connecting autonomous sensors and sensor systems. 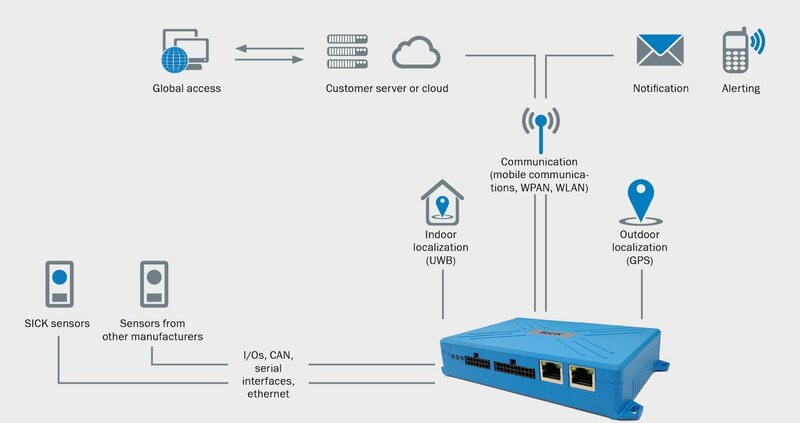 The mobile communication options have been extended with WLAN and WPAN – thereby creating the conditions for additional functionalities such as the indoor localization of mobile machines, for example. The data collected, analyzed, and individually visualized by the TDC-E means that the operational status of the networked sensors, as well as the processes in which they are used, are completely transparent. Optionally, SICK also offers customer-specific cloud solutions for further processing at a higher level. These solutions support the TDC-E with the MQTT, OPC UA, and JSON protocols via suitable interfaces such as GSM 3G+, WLAN, and Ethernet. With the new TDC-E gateway system, different sensor solutions for ships and ports, such as collision avoidance or driver assistance for cranes, can be connected and their data can be pre-processed, visualized and forwarded via a cloud or a direct connection to equipment control systems (ECS). The collection and logical presentation of all sensor systems, for example of a container ship or container terminals, enables continual and comprehensive status monitoring including complete system management and preventative maintenance. The TDC gateway systems from SICK are used to collect, analyze, store, and transmit sensor data in mobile and stationary applications. As a physical device, the TDC-E acts as the connection point between controllers, sensors, and intelligent devices and the cloud. The new gateway system with SSI, RS-232, RS-485, RS-422, an analog output, digital I/Os, CAN bus, Ethernet, WLAN, and WPAN offers the most common interfaces used in industry for connecting sensors and sensor systems from SICK and other manufacturers. Once real-time performance data, such as levels, drive temperatures, protective field infringements, read rates, uptimes, or collisions, has been collected, this information is summarized and analyzed in the TDC-E in order to minimize the data volume that is forwarded to external applications or to the cloud. The advantages are optimized response times and reduced network transmission costs. On the basis of pre-processed data, the TDC-E can carry out analyses which cause an alarm to be emitted via the switching outputs or an alarm message to be sent via SMS, if preset sensor values are exceeded or if faults occur, for example. The collected and processed data can also be used beyond machine and system operation on higher IT levels or in the cloud for intelligent services and applications. These Smart Services ensure that the operational status of the sensors in the field, as well as the entire process, are as transparent as possible. The TDC-E generates both active and predictive information for prompt process optimization and system maintenance at a precise time. The TDC-E accesses process and sensor data, which creates transparency and therefore enables significant increases in productivity thanks to processes being optimized. With its open interfaces, direct sensor connection, browser-based configuration with the SICK Engineering Tool SOPAS – without additional software and without license costs – as well as on-site or web-based data visualization, the TDC-E is also a cross-system data hub which is independent of manufacturers. It ensures that machines, plants, and processes are fit for Industry 4.0 and therefore for the future. The gateway system with mobile connection from SICK, and the new TDC-E in particular, are used as reliable, adaptable security and management tools for the sensor-supported management and monitoring of production lines, mobile machines, plants split over several different locations, wind farms, and similar facilities. Typical applications include tank and operational monitoring on ships and trucks, status logging and localization of swap bodies, remote control of systems containing large tanks and storage silos, remote system monitoring of natural gas transfer stations, operational monitoring as well as indoor and outdoor localization of vehicles, industrial trucks, and mobile machines. Further applications include recording events in crane systems, at level crossings, or in underground stations, as well as generally monitoring field instrumentation installed in a plant, including its integration into concepts for the purposes of preventative maintenance. SICK is one of the world’s leading producers of sensors and sensor solutions for industrial applications. Founded in 1946 by Dr.-Ing. e. h. Erwin Sick, the company with headquarters in Waldkirch im Breisgau near Freiburg ranks among the technological market leaders. With more than 50 subsidiaries and equity investments as well as numerous agencies, SICK maintains a presence around the globe. In the fiscal year 2017, SICK had almost 9,000 employees worldwide and achieved group sales of around EUR 1.5 billion. The TDC-E gateway system from SICK is used to collect, analyze, store, and transmit sensor data in mobile and stationary applications.